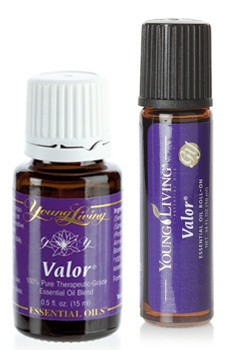 Valor is easily one of my favorite oils from Young Living. It’s designed to instill courage and confidence. It can help the body balance and align itself. It’s sweet and relaxing to smell. And it’s a fun purplish-blue color! Young Living blends fractionated coconut oil, spruce, rosewood, blue tansy, and frankincense to make this admired oil. They use fractionated coconut oil to keep the shelf life longer. Spruce opens and releases emotional blocks, increasing balance and grounding. Another big grounder and strengthener in this oil is the rosewood, which is also anti-infectious, antibacterial, anti-fungal, and antispasmodic. Blue tansy is one of my favorite scents, and it helps cleanse the liver and lymphatic system which helps to overcome anger and negative emotions, promoting self control. Frankincense stimulates the limbic system to help overcome despair and stress while also combating depression. It’s so admired that I am only allowed to order two 5ml bottles per month! They’ve been having trouble keeping enough in stock for everyone. For a while, you couldn’t order it and they had no estimated time for having it return! It comes in a dropper bottle and a roll-on, so you can keep it with you and apply to your wrists or neck when needed. Next Next post: Neck Pain: What’s really happening?